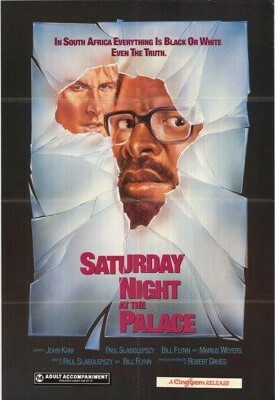 Developed for film from a play based on a true story, Saturday Night at the Palace takes place at a South African fast-food restaurant. The main conflict is between a white antagonist, Vince, and a black waiter named September. September was just about to close the restaurant to visit his family who he hasn’t seen in two years due to apartheid, then Vince shows up. Vince has just been kicked off his soccer team and out of his house. He takes out his anger on September. Dunton, Chris. “South African Plays by Stephen Gray, Review by: Chris Dunton.” Research in African Literatures 26: 235-237. Web. Kruger, Loren. “Theatre and Society in South Africa: Reflections in a Fractured Mirror by Temple Hauptfleisch; Decolonizing the Stage: Theatrical Syncretism and Post-Colonial Drama by Christopher B. Balme, Review by: Loren Kruger.” Reserach in African Literatures 30: 212-215. Web.